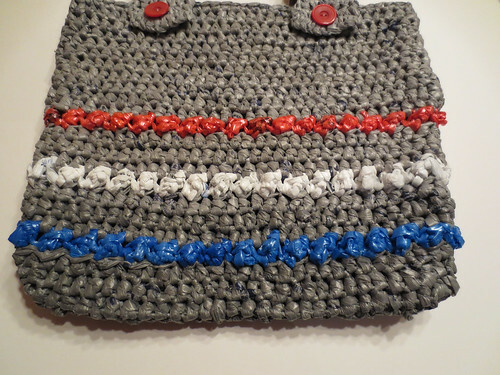 Using grey plastic bag yarn or plarn, Ch 31. Hdc in 2nd ch from hook and in each chain st down to end. Work 2 Hdc in end st, then continue around to the back side of chain by working a Hdc in ea st to other end then work 2 Hdc in end st.
Hdc in each st around to first end, work 2 Hdc in end st, then Hdc in ea st to other end, then work 2 Hdc in end st. Do not join at end of rounds, just continue working Hdc’s in rounds until advised to join. Hdc in ea st down to the two end sts, work 2 Hdc in the two end sts, then Hdc in ea st down to the other end. Work 2 Hdc in ea of those two end sts and continue Hdc in ea st down to the beginning of round. Join with a Sl St into the top of the first Hdc at side of bag at the end of rnd 4. FO with grey plarn. Attach blue plarn at side of bag and turn. You will be working on the inside of the bag for the puff stitch. The puff stitch is always worked on the inside of the bag or the W/S. *Sc in first st, Tr in same st, skip next st.* Repeat between * around the bag. Join with a Sl St into the beginning Sc of round. FO with blue plarn. Turn back to right side (R/S) of bag now. Working on the R/S of bag now, attach grey plarn into Sc where you just finished off. Hdc in ea st and in the top stitch of each Puff stitch around. Hdc in ea st around without joining. Just work in the round again until advised to join again. Finish off with grey plarn at the end of round 8 at side of bag. Using white plarn yarn, attach at side of bag and turn to the inside of bag to work the puff stitch again. Repeat round 5 for the puff stitch. FO with white plarn. Attach grey plarn yarn and repeat round 6. Make sure you turned and are working on the R/S of bag now. Repeat rounds 7 and 8 in grey plarn. FO with grey plarn. Attach red plarn yarn on the inside of bag and repeat round 5 for the puff stitch. FO. Repeat round 6 with grey plarn. Continue working Hdc in ea st using the grey plarn without joining. Work one round in Sc with grey plarn to create a nice trim edge on the bag. FO at side of bag and weave under all ends. Attach plarn at back inside in approx the 7th stitch from edge. (2 inches over from side edge) Ch 1, Sc in 6 sts. Repeat Row 2 until strap measures 6 inches long and approx 19 rows. Buttonhole row: Ch 1, turn. Sc in next 2 sts, ch 3, sk 1 st, then Sc in ea of last sts. Next row: Ch 1, turn. Sc in ea st and in the ch-3 buttonhole space work 3 Sc, then Sc in last sts of row. FO. Attach plarn in approx the 14th st on the opposite back side edge. Check your straps to make sure each side matches and the space on either side of the straps is the same width from the edge. Working on the inside of the bag, repeat back strap instructions above for other strap and buttonhole. Sew buttons on at front under buttonholes. Where was this 2 months ago!? :-). I absolutely love your patterns and now I have all my friends looking for interesting colored bags. I decided to make a walker tote bag for my mother-in-law a couple months ago. It turned out looking a little weird. I love the look of this one, so here I go again. Thank you so much for generously posting your patterns and making this craft so fun again. I practically get mobbed every time I take the plarn bags to the grocery store. I always give out your website if they want to know how to make them. Thank you again for sharing your creativity with the world. Gina – Thank you so much for the kind comment and I really appreciate your referrals to my site. I truly love hearing from people like you and am so happy you are enjoying my patterns. Best wishes and thanks for stopping by and leaving a comment. Recycling is really a nice and environmental healthy process. I really appreciate your work . Keep it up. Recycling is a very good way to re use used things. I appreciate your work. I regularly visit this website to get updated content. We should practice Recycling technique for our own like you have done. This is motivating me and sure all those who will read this. 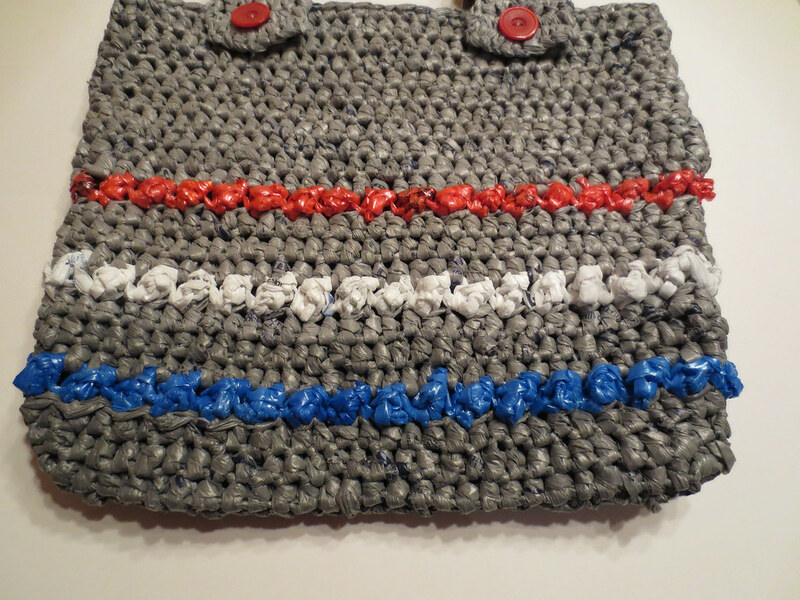 Donna – I used recycled retail bags to make this wheelchair tote bag. My picture tutorial is here that shows how to cut the bags 1 inch wide. 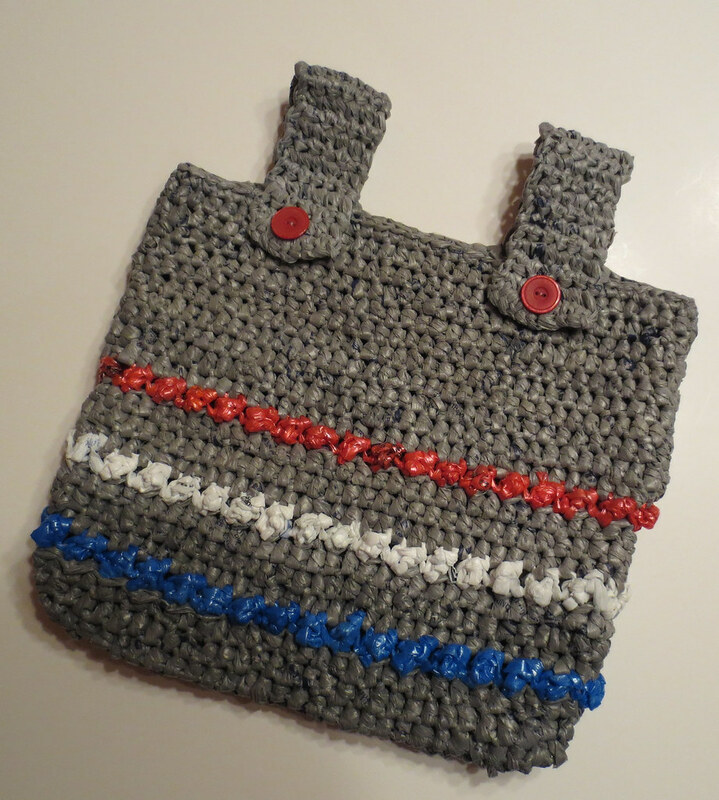 Let me know if you have any questions as you make the plastic bag yarn or as you work the pattern. I am happy to help if you have questions.